With my right hand, I gripped on to the side of the cliff. There wasn’t much to grab on to. The rock was red and sandy. I was perched on the tiniest of ledges which is sleek with the fresh rainfall. Below me was a waterfall that dropped off 12 feet or so. Down below, Marty was bobbing up and down in the swirling pool. The rain had picked up now. Large branches and small trees that we’ve passed hiking just a day or so ago were now shooting off the ends of the waterfall — torpedoing, javeling their way towards Marty. He tells me to throw down the second pack. I’m grasping it with my left hand. As I hang out over trying to lean to get enough leverage to throw it over the lip of the waterfall — so it doesn’t get caught right underneath in the froth. Instead makes it out to the pool where Marty can grab it before it rockets down the river and meets the torrents of water. I gripped hard. The harder I grip the less there is to grip. I heave and I tried to swing with my left arm through the strap at the top of the backpack and bent over.The backpack floats forward a scant few feet but far enough where Marty can scramble after it. He’s already holding the first backpack which is only floating because of foam mattress lashed to the outside. I’m not sure what comes next. I looked down after the pool — the bottom of the waterfall. There was nothing but straight up canyon walls. The walls were maybe 20 feet across. Went up well, it wasn’t really worth counting feet at this point. The only thing that matters was to get out of there. After the waterfall, the river took a bend and, beyond that there was no way of knowing what lay ahead. We were only into the trail a couple of days and started along the side of the river. It seemed comical at this point to think about it. First, we were like concern about getting shoes wet, getting boots wet. Now, I just needed to get off this rock over the waterfall without breaking my neck and, somehow land and grab my backpack. Then, float down the river and then — I don’t know what next. I don’t know what next. It wasn’t so much to jumping as a controlled fall. I pushed off with my feet and tried to keep my feet pointing downwards. My body flay all over the waterfall and splash down in the pool below. Immediately, the shock of the coldness — but also realizing that the rocks were burling over the waterfall as well turning around at the bottom with their banging up against ankles and knees. I scramble to get above water and chase down my backpack and, Marty who was being pulled away by the current. But I knew we’re going to be alright because I believe Marty was invincible. Not entirely but practically. There’s really no chance of rescue and you know we had it. There’s no one aside from brother Bob who had any idea where we’re at. Even now the name of the canyon, it was one of the Escalante canyons — but there’s hundreds of them. There are thousands of paths you can take. All sorts of trails and adventures you can lose yourself on. I’d made a habit of always taking the weird trails — always taking the ones that you weren’t likely to come across. The groups of Cub Scouts or the cheap pierced swigging rednecks, or the uber hikers, who just spent yearly income at the Patagonia store before heading out. No, we’re looking for solitude and weirdness and adventure. We’ve found it! Marty was the coolest guy at the local community college. This is no damning statement! This community college on the outskirts of Provo, Utah wasn’t eclectic mix including fifty something steel workers laid off from the aging World War II era, toxic plant that loomed over the horizon. After numerous labor disputes, in which the labor had no bargaining power, the steel mill was constantly changed and people were constantly laid off. Many of them realizing that they didn’t really have the skills to get a new job. Find a way into the community college and mixed with the high school drop outs like myself — vaguely stumbling towards the degree that will eventually be called Adult High School. Mormon Kids would come out to BYU, the giant Mormon-church owned university nearby but hadn’t made the grads but ended up biding their time at the community college. To their parents, we keep sending the checks and tell the folks back home that, “Oh, he’s going to school in Provo.” It’s a badge of honor. In amongst this, eclectic mix even Marty was unique; shaggy blond hair, a couple of years older than me. I went to a different high school or dropped out of a different high school but everyone knew he was a top-end skateboarder, old school punk rock fan, and drug experimenter. Now, he was at the community college studying ceramics. When I say studying, he was actually taking it seriously. Me, seventeen years old drop out and taking classes about mountaineering, photography, and creative writing. I’d seen him around from the window of my Volkswagen bus or when I’d post up on campus and hold court with my comrades each day in the hallway with the ragtag group of odd balls. Big Jerry who wore a cheap dark suit and talk in naval military terms and, rented on about conspiracy theories that will leave John Birch looking like a shrinking liberal. There was the old Alaskan gold miner who kept on trying to talk me up and, they coming up spending summer mining gold with them. I knew that, that adventure just involve way too much work and not enough women. There is Gary from Taber, Alberta who’d come down and was trying to break free of his constrictive Mormon bonds. But with Gary, came his Aunt who’s really the same age as him — an effervescent striking blonde with a super square husband. She’d hang-out with us. We avoided him and she made us look great. “Who was it, man?” A shaggy blond hair and a penchant for Hawaiian shirts — he was always wearing vans and corduroy shorts. He vaguely knew who I was and somehow we’d started making art and playing music and going on adventures together. Marty had a certain design about everything he was doing. He had gone to the high school across town with the fancier kids but he wasn’t fancy. His parents were working class and stable and square — where Marty was a free spirit. Everything he was doing seemed to be around making art. He was weird. There’s no doubt about it. He draws old with the burnt out voice of someone who’s had probably a couple too many LSD trips but came out just fine the other side of it all. Since meeting Marty, we’re loaded up with bright tag cruise heading to Grateful Dead shows in Eugene, Oregon and, California and, Arizona; some kind of caravan with Volkswagen buses things, old vans, pick-up trucks and every which way. Marty was relentless; never seemed to be tired, never seemed to give up, and never seemed to be too buzzed. He was always grinning, always going. Not hyper but constant movement but when he stops, he stopped and crawled up like a baby bear and slept and slept. He moves slow but always. So, chase up after Marty in the river. He held on to both backpacks but then let go of one as I caught up to it. We held on the best we could as we jumbled down the river. There’s no good way to get down there. The water is too deep — although, your feet want to seek the bottom. But once seek on the bottom; you’re banged by the rocks and boulders — ankles each one getting battered. Logs coming down — we’re dodging from side to side. Sometimes your foot gets caught. Sometimes you try to huddle around the backpack. Wrap your legs around it but then, your back gets nailed. You stretched up behind it and you kept rocking your balls. There’s no proper way to do this. We drift around the corner. The river takes it bend. There’s nothing but straight walls either side of us and, then another bend coming up. The Escalante canyons are notorious for getting lost, for getting twisted and for flashfloods. We weren’t naive. We knew all these things but I just don’t think we really paused we just didn’t pause to care. Now we are going somewhere and somehow we’d come out the other end. We figured out the way to come home from there. Now, I wasn’t so sure we are getting out the other side. As I held on to the backpack stumbling down the river, I thought about how I got to this place. This was all strange and foreign to me. This was a different kind of wilderness. I accustomed to growing up on the West Coast of Canada. Amongst, the temperate rainforest, giant ciders, dog furs. Where every time you ever went camping, one thing you knew what happened was — it would rain. Rain would fall. You’d likely see bears or sometimes a cougar like the night around the baiting poll trail. Where we all sat around a campfire, I noticed a cougar sitting in a place in our circle. The thick muscles were right next to me. At that point, you know there’s nothing you can do. There’s no use yelling, running, swatting, trying to fight. It will destroy you quickly and instantly if it wants to. I found myself at high school in Orem, Utah. Home of Osmonds Studios — the grinning Mormon variety entertainment act. I found myself lost and confused. The school was lily white but i played well with others’ and quickly found that for emerging young activist, it was a fertile playground. We came earlier and went down the lockers with tape. So, the students and faculty are like ‑ were greeted with our protest messages upon coming to school — did not sit well. But, we also sat in the vice principal’s office while he reminds us and say many of us confused by we thought that America had free speech. It made them more angry. Then, we lowered the US flag out-front and raised a giant condom saying, “Prevent A.I.D.S.” Also, not well received. We ran another buddy for school election — Paul Moody. In the candidates’ assembly, he stripped off his overcoat revealing a Nazi uniform saying that, “he wants to become our dictator.” I stand up in the audience saying, “Hey, stop him he’s insane.” Another buddy comes out as a henchman, tackles me down. The thing degrenerates into complete chaos as we incite high jinx and confusion. But, this wasn’t interesting enough. School was like living in an Archie comic book or living in a John Hughes’ movie. I was confused by invitations to dances spelled with alphabet cereal. Throngs of students going out together for various contrive dances ‑ with a pre-event meal at Sizzler. I have no interest in any of these. So, I found my way with the other misfits at Utah Technical College which was trying to evolve in ‑ well was evolving into Utah Valley Community College. And, various permeations as the life of the college goes on. For me, I didn’t care if it was a refuge away from the nonsense of high school and meeting new folks for new adventures. I quickly met some friends when signing up for mountain bike trip to Moab, Utah. Mostly everyone was — I was the youngest on the trip but quickly made friends have lasted. I quickly made friends with some older folks. To me, older folks, who are ten years older than me — who were always out on adventures throughout the far-flung corners of Utah. Usually seeking hot springs, mountain bike rides, camp-outs, I spent the next couple of years exploring all the corners of the state and the states around — building hot springs, building pools to capture hot springs. Going on endless mountain bike journeys and learning about that the easiest place to get a beer in Utah on a Sunday is a Mexican restaurant. I had a fake ID. I was learning about Frank Zappa, the early Pink Floyd albums, John Prine, smoking weed and hot wiring pick-up trucks. Somehow, in this case, brother Bob was back from Japan. Brother Bob is 18 months older than me. He’s a handsome lad but he is square. Doesn’t drink, doesn’t smoke dope, doesn’t know what to do with the girls but he sure likes to hike and easy going guy — but couldn’t quite figure out what he is doing with his life. We decided we’re all going our little camping trip and a little road trip to figure it out. 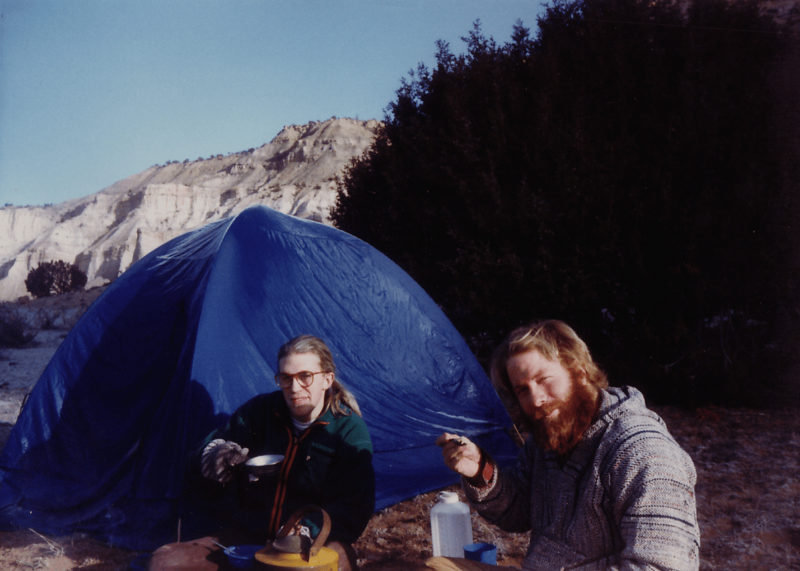 I remember his crazy little Japanese dog came along with us and, we camped at Kodachrome, Basin. His dog took off. We tried to call it back and decided it was best just out there lost ‑ devoured by a coyote. Unfortunately, he was not and it came yapping his way back to us. So, the three of us and the tiny yapping dog were cooped up in Bob’s tiny little car; as we toured around seeing snows in the area around Cedar City. Somehow, Marty and I decided on the fly that we’re going to head on this adventure. We saw a dial line on the map. Weren’t quite sure where it went, but we saw a way that we could get back hitchhiking. Bob was shocked to confused we would hitchhike back. We are ready for anything! We come around jostling and swirling in the water around another bend. We see our escape route. We’re on the right side of the river and the middle is where the trees and the torrents are the strongest. But up to the left, we saw a slope that steeped at first but after the first six feet, started to flatten out a little bit and, ended up in a little island — that would give us enough room to assess the damage and, get out of the water and figure out our next move. We have to get dry as the rain was coming down hard now. Whereas, the waterfall was just starting to catch up with us. We’ve seen the black clouds chasing us all throughout the day. But there’s nothing we could do except move forward. There’s no use trying to turn back when you’re halfway deep already. All you’re doing is going against the current. We’ve chosen to try to outrun it, or out walk it, or out stroll it but we were caught. We needed to get out of the water or someone will break a leg and twisting a knee — make it a lot much harder to get out of there alright. There’s even a tree up on this little platform which was 12 feet above the river — 12 to 18 feet above the river. So, even with a lot more rain we should be alright. We hope so, anyway. We scrambled to get across the river and climbed up on the rocks. Holding on to the rock, one of us climbed up. While I held both backpacks, Marty climbed up leaned back over the rocks, pulled the backpacks up which were now soaking wet, like pulling up a soaking wet sheet — heavy and thick but we needed that gear in there. Then, I drag myself up the rock and we stumbled, shaking and shivering. Up the rock to the flat part where we flop down, pulled out the tent fly from Marty’s backpack and hung it up while rain pelted down. We shook shook and shivered from the river. We watched the river rise — it gets deeper, it gets deeper, and the trees were bigger. But we can’t go anywhere. There’s no jumping back in now. The rain lets up. We scrambled to try to figure out some warmth. We ran a string — we ran a thin rope from the tree and prop up the other end on a piece of cast-off drift wood — anchor down with some rocks. We start to spread out, pull over our soaking wet clothes and hang them over. Start to pull the gear out of the backpack to see what was salvageable. Sleeping bags packed in stuffed bags that survived relatively all right and synthetic bags will dry out and still keep you warm (ish). I pulled out my emergency fire starter made from a paper egg cup. After pouring saw dust into the full dozen and covering up with wax, you break off one of these and whatever you can pack around it you’ve got a good start on a fire. We gather up some twigs and some bits of dried out drift wood and cobble together a quick little fire. As we pull off the stuff in the pack — stripped down, hovering around like cave men, trying to dry off and find something to get us warm. Fire at the camp stove and some hot water. Finally start putting our clothes on unto the rope and settling in knowing that we’re going to be all right for the night. We got this small tent put up and the air will start to dry it out. Fortunately, we had foam mats which were the only thing that kept the backpacks afloat — spread those out right on top of the rock surface. Finding some dry clothes, run around and find a little more wood — got a little bit of the fire going and start to see what there was to eat. We packed these packets of noodles and sauce that you’d thrown in from a packet into some boiling water and stirred up and, it will give you a quick meal. But the water, waterlogged all these into some sorts of glump. We tried to bring it back to life with some hot water but it was turn in into just a sort of a pasta, powdered cheese glump which wasn’t appetizing. We found some nuts and sat it on the campfire ‑ think of how we’re going to get out tomorrow. As we sat around the campfire, Marty rolled up his hand rolled tobacco ‑ which had survived the water ‑ thanks to his freezer strength ziplock. I found a little nugget of hashlit in my top back at my back pack and warmed that up and sprinkled that on top of tobacco. Finally, getting comfortable ‑ chilled out, sat around the fire. I looked at my legs, I realized that it was covered with bruises, twisted ankles, and the shins were black and blue. My knees were really starting to swell up and sore. They’re not the best at any of that times. Marty is built like a man-sized hobbit. Years of telemark skiing and skateboarding, he was taut and solid. Looked like he’s gonna be alright. Me, on the other hand, with delicate long distance runner legs was in bad shape. So as Marty’s rolling, he find inside of his medicine kit some muscle relaxers. “Great idea! This is really gonna help”, I tell Marty. As my knees swell up, I realized that it’s going to be a hard night getting any kind of sleep with all these aches and pains. I pubbed a couple of muscle relaxers, pain pills. Everyone in Utah seems to know all about prescription pills. We’re always pilfering from medicine cabinets when they visit their grandparents or even go to their relative’s house. They may not love some drug in Utah but they sure love the prescription drugs. Settling in, all I could think is, it’s going to be all right. When I come to — everything sounds like an echo chamber. Everything hurts. “What?” It takes me a moment to register that. Yes, indeed I am on fire — crawled up near the fire. The sparks had come over and my shirt had somehow caught fire. Not only my shirt but the clothes that we’ve hanged from the rope, we’re too close to the fire and, the fire had gone out of control. As we zoned off in the comfortable bliss — of the prescription medication. I rolled around on the rock. I get the fire out. I’m not too badly burnt, just around my ribs and a few spots on my legs where embers jumped over. I pull off my wet shirt — had somehow not only dried but caught fire hanging from the line. As have a pair of socks both roasting as though they’re little marshmallows. I quickly knocked them into the fire. The acrylic blend had made them melty and dangerous to touch. So, they were sacrificed. But the smell was horrible — of the melting. Also, that was one pair of socks. Counting our losses, we put the fire back under control and climbed into the tent and slept through the night on the rocky terrain. In the morning, we assessed the damage. Burnt clothing, battered legs, but over all it could have been worst. We decide we’re going to go fast and try to get out as quickly as possible — to get regroup. We’re low on food and don’t want to get stuck out if this swelling and injuries continue. We’ve packed up and go to put on our boots. Marty have just bought a new pair of Italian lightweight hiking boots but their size too small for him, as it turns out. So, I agreed to buy them off from him for 50 bucks. He used Bob shoes — borrowed from before Bob went home. We go to put on our shoes and realized that the toes in the toe caps have melted out. It melted and reform into a mushy mess that you couldn’t really quite get your foot into. Resulting, me having to cut out the front toe part on my boot and have this thing like ridiculous flip-flops — reversed flip-flops or some sort of handicapped ankle brace to trod out that day. We packed up our gear and realized that it’s going to have to go back into the water before we could go anywhere. So taking our hard fought dried out gear, we flung them down the river and both banzai jumped into the river to catch up with the bags and flipped down, until the river was wide enough to give us a bank — the canyon was wide enough to give us a bank. Finally, back on our legs trying to wring out the backpacks and get it down to a weight where we could carry, going to send in more gear if we could but, were down to bear loads. Packs on back, we’re hiking through Aspen forest as we get into the muddy river bank stomping out. Now, toeless boots are full of mud — we’d flumped along on some kind of drudgery march. We find the stretch of river, where it opens back up with a little bit of a peaceful view with look back where we’ve camp a couple of nights before — just a nice campsite on the side of the river. Just like what you’d want. We sat down and Marty pulls out a can of beans and a can of Vienna sausages. It’s hard to argue with him. He’s sometimes has those moments of zen. We opened it up with a pocket knife, folding aside the jagged lid. Take turns scarping spoonfuls of cold beans out of the can — picking Vienna sausages out of the tiny tin. My stomach is a bit of a sensitive one. This wasn’t going to be the best but it felt good going down. I just hope it stayed there. We continue tramping out and rather than delight — have adventure and mystery. We drudged out but knowing we’re going closer to somewhere but realizing that the end of the trail, it wasn’t a warm van or any kind of waiting vehicle, or any kind of welcome reception — still were off of far-flung state by way. Close to really nowhere, with a long journey before any of us was somewhere we could call home. We also realized between us we have about seven bucks which didn’t really help things. So, as the canyon widens and closes and, widens and closes we have no idea what point will pop out. The map is long damaged by now and it was hardly useful in the first place. It was barely a dotted line connecting — right along the side of the river connecting to two names spots. It’s hard to keep them all straight with all the dead horse this and, this to that. It doesn’t really matter. At some point, we’d popped out somewhere else. We did! Pop out to a small parking lot with a few cars in it. A dust covered super wagon with all kinds of gear stickers and gear bags in the back for someone who’d probably headed out deep into the Escalante for a week or more. A couple of other vehicles are piled up from day hikers but no one was around. It was getting dark. The sun was starting to set. We were tired, cold and look like demolished vagrants. A smothering of colorful camping gear — busted out, cut out and scratched and clod up — but not bad enough to need an ambulance by anyone’s means. So, we stepped out onto the highway — realizes nothing more we could do and stuck out our thumbs. At least, we were out of the canyon. The hitchhike home was fairly efficient. But like all hitchhikes, you meet some interesting characters. Within half an hour or so, after coming out of the canyon and the small parking lot — standing up on the side of the road — we saw maybe three cars go by before one picked us up. It was an old dude. Apparently, a photographer, driving an early 80’s Sedan filled with junk and cigarette butts in the back. But, we didn’t care. He’s going somewhere. But like what always happens or like seems to happen, he started to get a little bit weird — a little bit creepy. He kept on pulling over on vistas talking about the color he was going to get from the pictures but, he didn’t really seem to be a photographer. I don’t know what his game was but he got us in one of these towns that scattered around Southern Utah — a small main street, a gas station off the side of the highway, a few homes and a couple little shops and a Mexican restaurant. A Mexican restaurant and a post office is sometimes all they got. I don’t know if this one was Green River or Vernal or Fruita or which one it was, I don’t really care. The next day, we hoofed it through town down to a freeway on ramp and a highway. A couple of crazy young fellows and a soup-up Toyota pick-up truck offers a ride. We hopped in the back of the truck and it’s cold. We pull out our sleeping bags and huddle in. We realized real quick man, this can be real dangerous. These guys were drinking beers and throwing the cans in the back — boomed it heavy duty and fast. As we get up to twisty mountain roads over the passes, they’re passing on the wrong side of the highway — going around the corners. But we huddled in and just held on until Provo.